An important aspect of spinal health is improving or maintaining the strength of your core muscles. Your spine on its own can only support about 30 – 40 pounds of body weight so it needs your core muscles to do a lot of the heavy lifting to help keep you upright. When your core is weak, your spine does extra work that wears it down and will ultimately lead to pain and injury. It’s also important that the strength of your core muscles is balanced: weak abdominals and strong back muscles can cause lower back pain. But doing sit-ups isn’t going to rectify this situation. Your posture is mainly supported by muscles deep inside of your body – muscles that are not worked by doing sit-ups. But the postures and movements involved in yoga and pilates are able to reach those deep core muscles, as well as the core muscles closer to the surface. Another key component of spinal health is flexibility. When flexibility is reduced, we run the risk of pushing our body too far and causing injury. The best way to maintain or improve your flexibility is with gentle stretching on a regular basis. Both yoga and pilates deliver this kind of stretching to your muscles, tendons, and ligaments. When muscles, tendons, and ligaments are not regularly and properly stretched, they shorten and toughen, which reduces flexibility. This is especially important for those of us who spend hours on end sitting at a desk every day. Our bodies did not evolve to endure that much sitting and, as a result, without other forms of stretching, our muscles, tendons, and ligaments suffer. But don’t worry – even if you’re already experiencing lack of flexibility, it’s never to late to start. Yoga and pilates can help improve your flexibility by gently stretching the areas that need it. 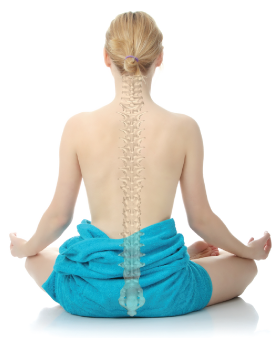 Good posture is really important for spinal health. The spine has a natural curve in it. While the spine is meant to move and be flexible, if it is constantly in an unnatural position, damage to discs and vertebrae and even nerves can occur, which will result in back pain and can even affect other areas of your body. Both yoga and pilates encourage practitioners to focus on correct posture and alignment during different poses and moves. This focus generally translates to a greater awareness of posture and alignment outside of yoga and pilates classes as well. Also, because yoga and pilates are strengthening your core muscles, it will be easier to maintain proper posture and alignment. If you are free of back pain – great! Now is the time to start yoga and pilates. Even if you follow another fitness regimen, adding yoga and pilates will almost definitely improve your fitness level, endurance, and performance because of its ability to improve core strength, balance, and flexibility. Keeping your core muscles balanced and strong and keeping the moving parts of your spine flexible will also help you stave off the degenerative process that happens as we age and will protect you from back and spine injuries. If, on the other hand, you’ve begun to notice a lack of flexibility, balance, or core strength, yoga and pilates can help you repair the imbalances in your body. In fact, even if you are already experiencing back pain or if you are recovering from a spine or back injury, your doctor may actually prescribe yoga or pilates as part of your recovery. This is in part because your doctor will want you to start new habits that will support your spine health, even after your official treatment is over. No matter what your age, fitness level, gender, or weight is, it’s highly likely that you’re able to take part in a yoga or pilates class. Make sure you pick the level that’s right for you and, if you’re brand new to the practice, let the leader know ahead of time. While advanced yoga and pilates can be incredibly difficult, the basics are pretty easy and will still give you substantial spinal health benefits. We think these are five pretty good reasons for you to give yoga or pilates (or both!) a shot. Since we are passionate about spinal health at Advanced Spine & Sports Care, we’d love to see everyone taking up yoga or pilates. If you’d like to know more about ways to maintain your spinal health, or if you are experiencing back pain or pain caused by a spinal issue, we encourage you to contact us online or by phone (773.868.0347) today. *Always consult with a medical professional before beginning any new exercise routine. What Is the Best Treatment for Sciatic Nerve Pain? If you are interested in preventative health care and/or the treatment of an injury, our treatments focus on natural wellness – without drugs and surgery. Chiropractic care is based on maintaining the structural alignment of the spine and extremities and also taking into account the role of diet, exercise, and emotional balance.